Its compact cart is easily moved right to the job site. It is 44.5 inches long x 24.5 inches wide x 54.5 inches high, mounted on casters, equipped with 15 feet of hydraulic pressure hoses and quick disconnect fittings. Electrical controls conform to National Electrical Manufacturers Association (N.E.M.A.) standards, complete with start and stop controls, and a remote pendant speed control. The main electrical panel includes a 12V 60 amp, deep cycle battery with rectifier charger operating from voltage listed in table below. Complete with oil, hoses and connectors. Remote speed control is standard. 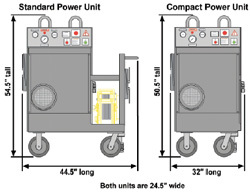 There are three new power unit configurations that are available: one with a 10V outlet (110-Volt AC - Single Phase - 15 Amp), one that has a compact cart without a hose reel or shelf (shown below), and another that is suited for outdoor use in cold climates. Our standard remote speed regulator can change speeds (GPM) remotely and conveniently by merely pushing the increase or decrease button on the pendant control. There is no loss of magnetic force if service power fails; 12-volt battery automatically supplies current for magnet. Automatic battery charger maintains top level charge in battery (audio alert when not charging). Oil is always radiator-cooled before returning to tank. head. 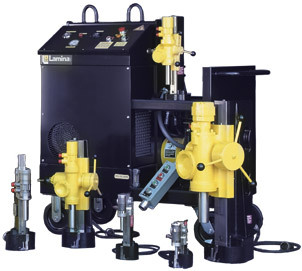 In addition, by using a simple shunt device, the unit may be used in any number of applications requiring a hydraulic power unit. To order this shunt device, please specify part number ASSY-21. This shunt device is required for drills ordered without a magnetic base (-NMB).